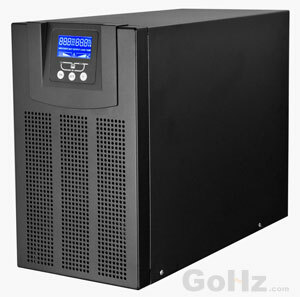 Most UPS's are sized for the client load requirements. However in cases of smaller UPS systems won't comply with electrical regulations! Let's consider a client needs a 30kW supply, to 2 100amp distribution boards. One 20 meters from the UPS and one 80 meters away. Each DB has some 32amp circuits up to 20m long. The distribution circuit is protected by 63amp BS60947 devices and the final circuits are 32amp BS60898. Specifically for a UPS system, what is going to define your UPS sizing? We can start by sizing the unit to 36kW. In some instance you might want to consider an additional 20% for recharge it depends on the ups and clients requirements. A discussion should be had with the client to discuss resilience: n only, 2n, n+1 etc. From here we have a starting point in selection. But is that enough? Now we need to have a look at the electrical design, but before I start. We are in a world market, and anything I comment on in the UK may not be appropriate for your country. Always reference in country regulation, legislation and the manufacturers recommendations to select the UPS. My figures, where given are for demonstration not application! To start with you need to plan out your sub-distribution and final circuit layout, with particular attention to the protective devices. You need to pay special attention to their maximum Zs impedance levels to provide disconnection in a given time for the circuit. Then we need to consider the supply source: we need to consider all supply sources independently or consecutively as appropriate. A Static UPS may have two or three independent sources of supply: Utility/ Inverter, Generator/ Inverter, both of these but on static bypass, both with maintenance bypass, and DC source/ Inverter. Each will have a specific impedance and possible fault current. And there lies the problem. A UPS is a high impedance source, so fault currents are low. When on a Utility/Generator supply, as long as the incoming impedance is conducive, you get a good impedance at the UPS (Zups) as it uses the AC supply to clear the faults. However on the DC/ Inverter source you have no AC source to fall back on. Once the Inverter goes into overload under fault conditions, it shuts down, drops the load and the fault doesn't clear until the mains returns and then the fault is reactivated. At this point I will make a slight diversion. In the real world you should make every effort to collect all client related data in an efficient manner with as few return visits as possible. We need to design a system that will be maintainable. Discuss with the client and maintenance provider what their maintenance requirements are. It will depend on their Resilience Topology: in an "n+1" system, you should be able to maintain the UPS with little trouble, however you may not be able to isolate the infrastructure for maintenance due to load outages. In a "2n" system you should be able to maintain the infrastructure but you may not be able to maintain the UPS if the client has not specified their CoLo or other services contracts correctly. In a "n only" system you might not be able to maintain either without risk to the load or an outage. In any case try to install non-intrusive devices such as thermal windows, mechanical interlock door openers ("frig" buttons) to assist, safe access to busbar, cable chamber and functional chambers by fitting see through barriers and IR windows. It is import to get the varying systems straight in your head, possibly making adjustments to the topology which are specifically led by the client. From here we need to look in two directions: 1) electrical design, 2) design for concurrent maintenance. Taking a quick look at 2) we need to engage with the client and maintenance provider to understand what they need. The Uptime institute can give us direction on Tier classification and the ability to maintain certain types of installation, but get a clear "buy in" from the client as to what level of resilience they expect during maintenance. For instance: a 2n system will give two electrical supplies to a piece of equipment. But the client might not let you switch one off for maintenance. A n+1 system might allow you to switch a module or UPS off for maintenance but the sub-distribution infrastructure might not be suitable as you can't turn it off the circuits without an outage to the equipment. Build in some form of live non-intrusive inspection such as infrared windows etc to isolators, busbars, switchboards etc.